I’ve made this curry paste several times recently, it adds great flavour to any dish, plus it’s packed full of goodness and immunity boosting ingredients for this time of year. And I’ve made chicken curries for my boys with it. I highly recommend making a huge amount of it and use it lavishly! I have used lots of spices from the lovely Spice Kitchen UK and you’ll find the full recipe on their blog…I hope you like it! This entry was posted in Curry, Dinner, Gluten Free, Healthy, Indian, Lunch, Vegan, Vegetarian and tagged cooking, recipes, spicekitchenuk on February 26, 2018 by Elaine @ foodbod. When I started making fruit yeast water bread from apples, I didn’t realise that I was taking the first steps towards making apple cider vinegar, as fermenting apples in water is pretty much all it takes to make your own ACV. I’ve now made several batches of my own, using 3 different methods, and I can state from my experience that the simplest is the best. Like with all these things, if you search methods and recipes, you will find endless options, some more convoluted than others, some requiring daily stirring, some requiring the addition of uncooked chickpeas and bulgur wheat, and all extolling the virtues of creating a ‘mother’. The mother is what makes apple cider vinegar a bit cloudy or murky looking, and what gives it it’s goodness. Not every attempt at making vinegar generates a mother, and the vinegar is still good without it. Creating a mother is the pinnacle in making apple cider vinegar, and what we must all wish to manage, but you haven’t failed if you don’t achieve it. Just making your own vinegar is good fun, and it tastes really good. Mine haven’t been as sharp as mass produced vinegar, they’ve been much more subtle and much more obviously made of apples. These are all apple cider vinegars. The photos below show them in the process of fermenting, you can see how the colour changes. The honey coloured liquid, in the middle above, started off as the cloudy yellow jars on the far right photo below..
You need a clean jar/vessel, water, apples and honey, and some cheesecloth. *I’ve used organic apples and non organic, and both have worked. *I’ve used water boiled and cooled, and water from the tap, and both have worked, but our water has very little chlorine in it. If yours has more chlorine, or you’re not sure, then use boiled and cooled water. *I’ve used standard runny honey and a milder set honey, and both have worked. Wash your apples and roughly chop them into chunks, removing the stalk, but keeping the peel and core and seeds. PLEASE NOTE: you can just use apple peels and cores if you’ve got them leftover from a recipe. It’s a great way to use peelings! Fill your vessel 2 thirds with apples, top up with water and add a tablespoon of honey. A rule of thumb is to add a tablespoon of honey per litre of water. Use a clean jar or bowl as a weight to keep the apples under water (between explained in the photos below), cover with cheesecloth/muslin to keep any fruit flies out, and let vapours escape. Make a note of the date, place the vessel in a dark cupboard and forget about it for 3 weeks…well, not completely. Check it every so often to ensure that there is no mould or fruit flies, and that the fruit remains under water. *If mould appears it will be green; I had little green fluffy balls appear on a batch when I experimented with pears, and again when I tried using a pomegranate. If mould appears I’m afraid all is lost and you need to discard everything and start again. *Initially you will see bubbles as the fruit ferments. That’s good. They will eventually settle down. After 3 weeks, drain your liquid through clean cheesecloth/muslin and collect it in another clean jar and add another tablespoon of honey. *If you have made vinegar previously and have some left, or you have kept some of your own vinegar mother, you can add a bit of that too. Cover the jar once again with cheesecloth/muslin, and put it back in the cupboard, and leave it for another 3 weeks. *If you see white flecks like I have, it’s fine, these could be yeast, or even a growing mother. *If you see a white thin jelly like layer forming, that is a mother. Don’t disturb it, just let it happen. After another 3 weeks, give it all a stir and give it a taste. If you like it, start using it, if you want more acidity, or deeper flavour, let it ferment for longer. Store with a lid firmly in place. In December, I started a batch of orange vinegar, just oranges, water & honey…and it smelled AMAZING all over Christmas, perfect timing! This is what’s left from this jar about once it was drained…and it still smells amazing! I hope this is all helpful and interesting and you feel inspired! Please do let me know if you have feedback or questions. I am taking my vinegar along to this week’s Fiesta Friday, I hope you can join the co hosts this week, Lily and Judi, and be inspired by everyone’s dishes.. This entry was posted in Gluten Free, Healthy, Vegan, Vegetarian and tagged ACV, apple cider vinegar, cooking, fermenting, fiesta friday, recipes, vinegar on January 18, 2018 by Elaine @ foodbod. Falafels cooked in a aebelskiver/poffertjes pan..
I’ve made falafels many times before, always oven baked because I could just never bring myself to fry them! 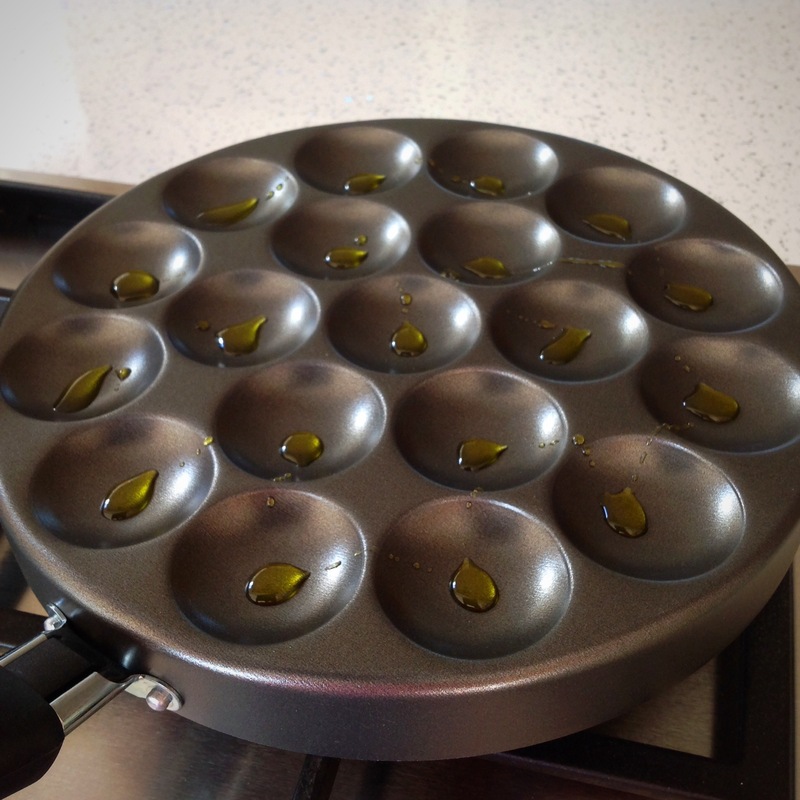 I’ve also seen posts from people using a poffertjes pan to cook falafels, and other patties and Indian cutlets, and decided it was time for me to finally treat myself to one. I used it for the first time today for falafels and I will definitely use it again for these and other concoctions. 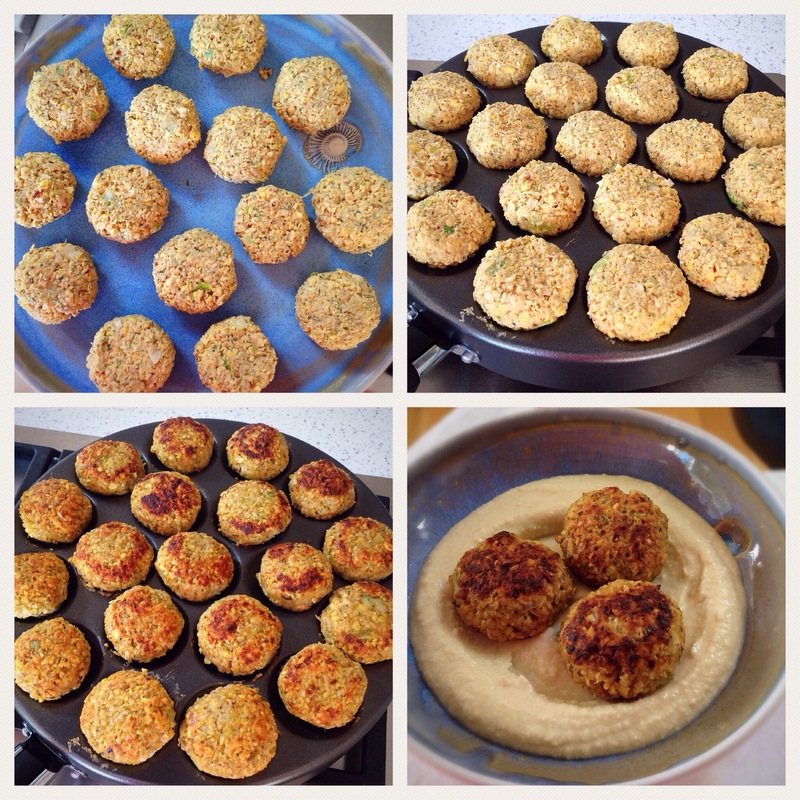 The recipe I’m sharing below is a pretty standard falafel recipe, it is simple to play with it and create your own versions however. Today I threw together chickpeas, spring onions, garlic, dried herbs, spices, chickpea flour and lemon juice and it worked a treat! I got in there with my hands and started making little balls of mix which I flattened slightly in preparation to cook them. I have to tell you – I didn’t weigh or measure anything and I produced the perfect number of patties for the pan by pure luck….or sheer fluke!!! I served mine on freshly made homous as is traditional, I highly recommend it! 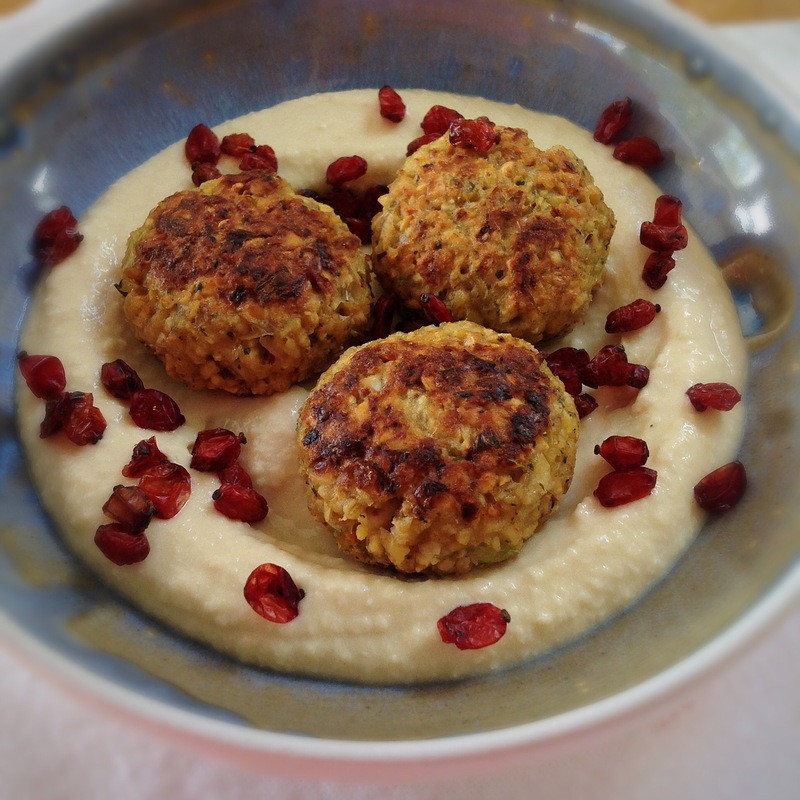 This entry was posted in Dinner, Gluten Free, Healthy, Lunch, Mezze, Middle Eastern, Sugar Free, Vegan, Vegetarian and tagged falafels on November 3, 2017 by Elaine @ foodbod.